Dora Thornton, Curator of Renaissance Collections, details how Queen Elizabeth I used her portrait to manipulate her public and private image. I know I have the body but of a weak, feeble woman; but I have the heart and stomach of a king. The same message is promoted by a gold medal designed by the painter and miniaturist Nicholas Hilliard, which commemorates the survival of England – a divided and vulnerable Protestant nation – from the perceived threat posed by international Catholicism. On one side it shows the Queen three-quarter face, with a Latin inscription that translates as ‘No other circle in the world is more rich’, promoting the strength and wealth of the English crown. On the back of the medal, a lone bay tree on an island in a stormy sea is labelled E R (Elizabeth Regina), ‘Elizabeth, the Queen’. The bay tree was thought to provide protection against lightning as the inscription explains: ‘Not even danger affects it’ – unlike the ship in the background, which is sinking after being struck by a bolt of lightning. This medal promotes Elizabeth as a political survivor; one who has lived through Catholic conspiracy at home and foreign invasion and was designed to be worn as a token of loyalty and allegiance. For a fine miniature by Nicholas Hilliard of Elizabeth’s successor, James I, see the superb Lyte Jewel in the Waddesdon Bequest gallery 2A. Nicholas Hilliard, gold medal of Elizabeth I ‘Danger Averted’. Cast and chased gold. London, c. 1580–1590. Her famous virginity was central to her image in so many portraits, not least in a famous gold medal, the Phoenix Jewel, in which she is compared with the phoenix who, according to legend, was consumed by flames and then rose out of its own ashes to live once more. Nicholas Hilliard, The Phoenix Jewel. 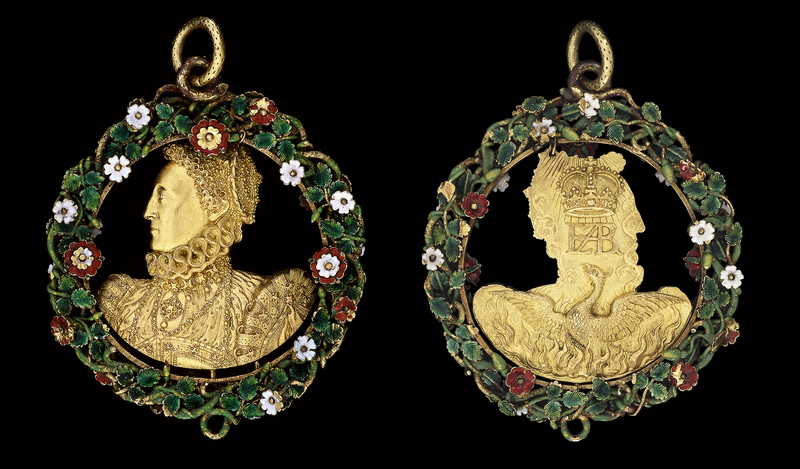 Gold medal of Elizabeth I cut out in silhouette in enamelled border. London, c. 1570–1580. The rebirth of the phoenix came to be associated with chastity, the only virtue which it was thought a woman could truly attain. That imagery is at the heart – literally – of the famous ‘Phoenix’ portrait of Elizabeth named after the jewel she wears on her breast. The emblem appears again on the Phoenix Jewel, in which the crowned monogram of the queen appears above the image of the graceful phoenix fluttering sensuously out of the flames. Unlike Dumbledore’s pet, Fawkes, in the Harry Potter series, in Elizabethan England the phoenix was definitely female – an element of its unique rarity, beauty and distinction. There can only be one Queen of England – there can only be one phoenix. When Shakespeare wrote his enigmatic poem, The Phoenix and the Turtle around 1600, he presented the Queen as the Phoenix: ‘Beauty, truth and rarity,/ Grace in all simplicity’. Not that there is much simplicity in Elizabeth’s presentation of herself on the front of the Phoenix Jewel, which is emphatic and striking. Her profile is strongly silhouetted in a cut-out construction, superbly chased in the gold to pick out the details of her dress: the rich pearls, jewels, ruff and silk velvets. An enamelled wreath of Tudor roses surrounds her, while the loop worked into the frame shows that this, too, was intended to be worn. 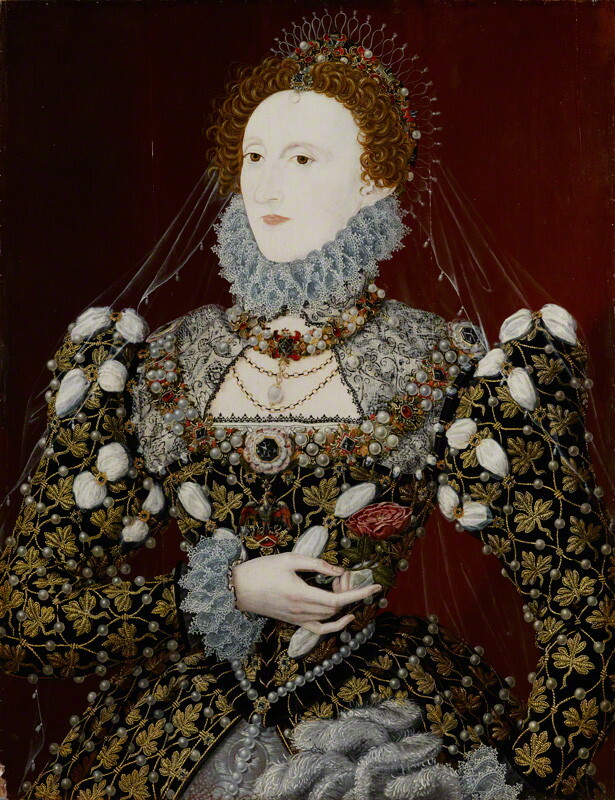 Associated with Nicholas Hilliard, Queen Elizabeth I. Oil on panel, c. 1575. © National Portrait Gallery, London. Elizabeth encouraged her portrait to be shown off as a luxury fashion accessory. A specialised court workshop produced miniature portraits as cameos, relief portraits cut into onyx and sardonyx stones. About 30 portraits of Elizabeth survive in this tiny format, a revived classical art form which allowed the engraver to play with the different-coloured layers in the stone. In ancient Rome, cameos celebrated the power of emperors and were given as political and diplomatic gifts. Renaissance rulers revived the practice in a self-conscious way. Cameos could also be set into rings. The diarist John Evelyn tells us that Elizabeth’s fame gave these rings value long after her death, when he records that he saw the musician, Jerome Lanier, wearing one in 1654. Lanier had served as ‘Musician in Ordinary’ to Elizabeth from 1599, so he wore the ring in her memory. Along with rings, cameos were also set as pendants. We have a fine example in the Museum’s collection where the cameo pendant is set in a gold frame made to look like a spoked wheel studded with rubies. The whiteness of the enamel sets off the whiteness of the Queen’s skin on the cameo. Elizabeth was extremely proud of her pallor, priming her face with a foundation made of poisonous white lead and vinegar, so as to set off her almost black eyes and red hair. 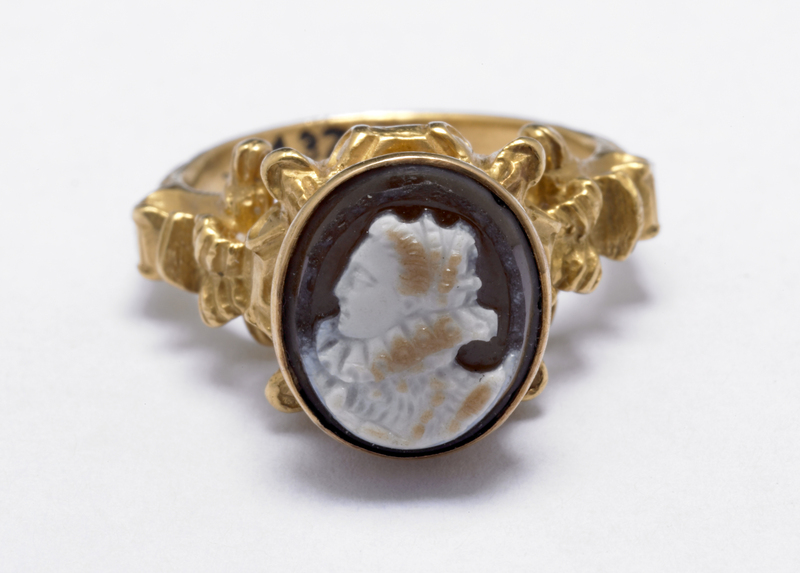 Gold ring with onyx cameo portrait of Elizabeth I in profile. London, c. 1575–1603. A third cameo, slightly larger than the other two, is the finest of the group in terms of the detail of Elizabeth’s costume and the way in which the different coloured layers in the stone have been exploited to give a sense of depth, vivacity and modelling to her portrait. 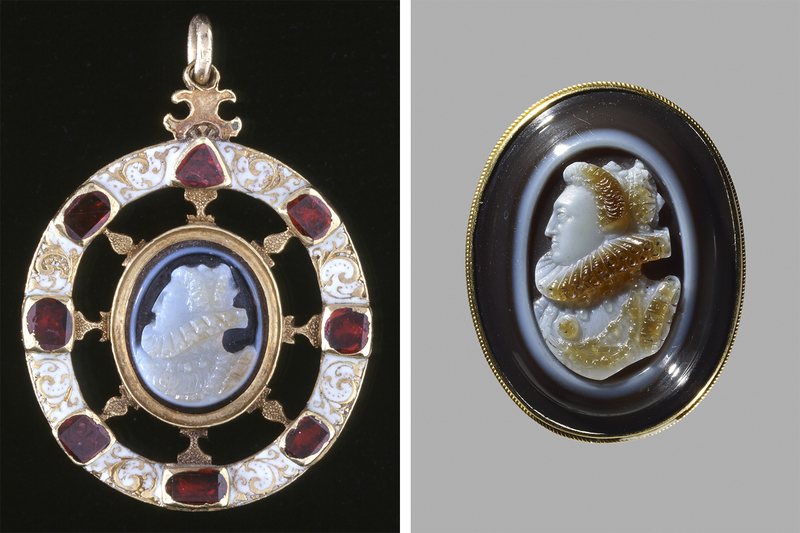 Left: Gold enamelled pendant, set with rubies and an onyx cameo portrait of Elizabeth I in profile. London, c. 1575–1603. Right: Onyx cameo with profile portrait of Elizabeth I. London, c. 1575–1603. 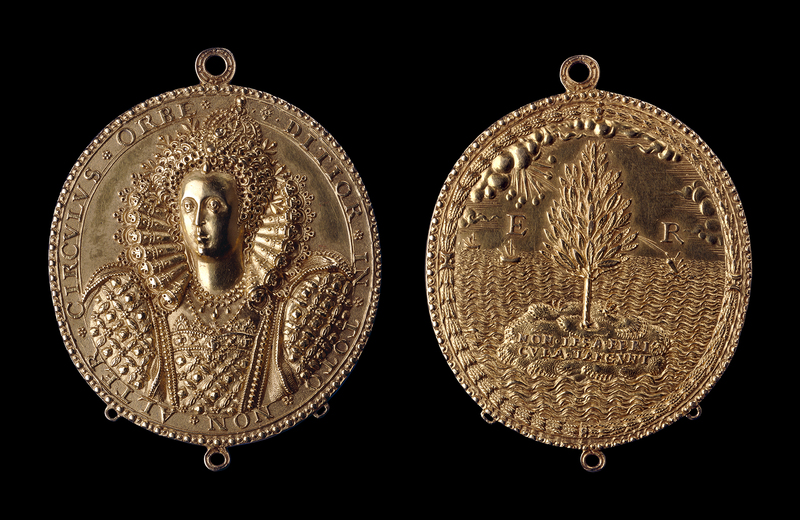 Elizabeth I’s cameos and medals demonstrate how she and the artists and writers around her built a cult around her image. ‘Her Majesty’s Picture’ circulated as the currency of fame. The exhibition Power & Portraiture: painting at the court of Elizabeth I is open at Waddesdon Manor 7 June to 29 October 2017, Wednesdays through Sundays. You can find out more about the British Museum's Waddesdon Bequest in Dora Thornton's book A Rothschild Renaissance: The Waddesdon Bequest or visit it in Room 2a.